In continuation of a very successful series of 5 conferences in Europe and overseas, we invite you to participate in Diffusion Fundamentals VI, scheduled for August 23rd – 26th, 2015 in Dresden/Germany. As a ubiquitous process of random movement, ranging from molecular up to macroscopic and even cosmic scales, diffusion is key to spreading phenomena in quite diverse areas. Bringing together scientists from disciplines as different as archaeology, ecology, epidemics, ethnology, linguistics and sociology with biologists, chemists, physicists, mathematicians and engineers, Diffusion Fundamentals VI is scheduled to highlight the astonishingly similar patterns of spreading phenomena in Humanities, Natural Sciences and Engineering. A pre-conference school will be organized on "Fundamentals of Diffusion and Spreading" on August 23rd, 2015 in the conference building. The half-day event is in particular scheduled for PhD students, post-docs and younger scientists who would like to gain an introduction into the mathematical concepts used for the description of spreading phenomena. We are very happy that leading scientists in the various fields have accepted our invitation to talk to you during this conference. Jointly with the peculiarities of their topic they will also highlight the features in common with other phenomena of spreading or diffusion. Being well aware of the wide range of different expertise within the audience, they will all do their best to address everybody - seeing its diversity as an opportunity to stimulate a rich, interdisciplinary discussion, rather than an obstacle. There will be plenty of time for discussions, during the sessions, in front of the posters as well as during the breaks and social events. The schedule of the pre-school and the conference can be found in the program section of the conference website. The list of posters is included in the program section of the conference website. "Best Poster Awards" are scheduled for posters highlighting particularly impressively the impact and beauty of interdisciplinarity in diffusion research. Poster abstracts may be found online in volume 24 of the Diffusion-Fundamentals online journal. The second part of the DF VI special issues will also contain short versions of the invited plenary talks and full length papers (release scheduled for March, 2016). As already tradition within the Diffusion Fundamentals conference series, all contributors of accepted poster abstracts are invited to submit a full length paper for publication in the Diffusion-Fundamentals Online Journal (diffusion-fundamentals.org). Please use the template (.doc) and send your paper before December 31st, 2015 by e-mail to abstract@diffusion-fundamentals.org. 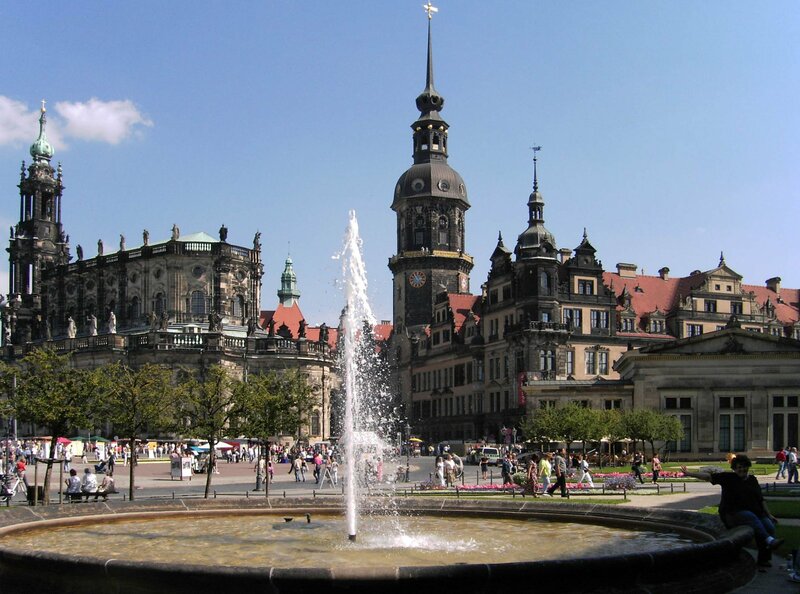 Prior to the conference dinner, on Tuesday afternoon (August 25th) the participants will have some free time for an individual walk through the magnificent city of Dresden. The conference dinner will take place in the restaurant Pulverturm which is located in the historical center of Dresden next to Frauenkirche. A nearby tram stop is "Synagoge" (lines 3 and 7). From the conference site you may take tram line 3 from "Nürnberger Platz" (direction "Dresden Wilder Mann") to "Pirnaischer Platz" or "Synagoge" (5 or 6 stops, respectively). The walking distance from main train station is about 25 min (ca. 2 km). The participants are invited to join the optional Guided Walk through the City of Dresden (free of charge) which is scheduled to start on Wednesday 26th at 3 pm after the end of the conference. Meeting point is the tram stop "Synagoge". The Diffusion Fundamentals VI conference will take place at: Dresden University of Technology, Chemistry Building, lecture theatre CHE S89, Bergstraße 66, 01069 Dresden, Germany. 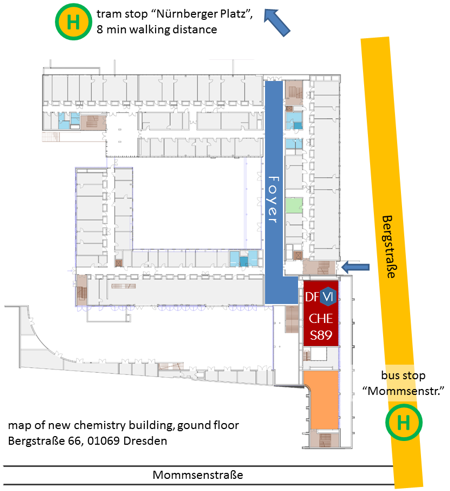 The new chemistry building can be accessed using tram lines 3 and 8 (tram stop "Nürnberger Platz") or by the bus lines 66 (bus stops "Mommsenstraße" or "Technische Universität") and 61 (bus stop "Technische Universität"). The conference dinner on Tuesday will take place at the restaurant Pulverturm which is located in the historical centre of Dresden next to Frauenkirche. From the conference site you may take tram line 3 from "Nürnberger Platz" (direction "Dresden Wilder Mann") and get off at "Synagoge" (6 stops). The lectures will be given in the lecture theatre CHE S89 on the ground floor of the new chemistry building. The conference office is located in the foyer of the building. Also the Welcome Party on Sunday, the lunches, poster sessions and coffee breaks take place in the foyer, next door to the lecture hall. Förderverein der Sächsischen Akademie der Wissenschaften zu Leipzig e.V.